For a League One side to knock Hibs out the Scottish Cup on their own patch would have taken something extra special. In the end, Raith Rovers gave a decent account themselves at Easter Road but never looked capable of causing the upset the travelling fans had been dreaming of. A 3-1 defeat was a fair outcome, and certainly no disgrace on Rovers part against Premiership opposition. But if there was any disappointment afterwards it was that they had been unable to take advantage of a Hibs side currently without a manager and going through a period of upheaval. For the underdog to prevail, Rovers would have to start the game well, and score the first goal. They managed neither. In fact, Raith's best spell of the game came in the closing 20 minutes when they were already 3-0 down, and while it was great to see the fighting spirit when the roof could have caved in, it came too late to give Hibs a proper scare. John McGlynn made two changes to the starting line-up with Robbie Thomson returning as first-choice goalkeeper after just one match on the bench, with Nathan Flanagan also recalled at the expense of Chris Duggan. With nine buses and almost 1700 tickets sold, the travelling fans certainly had belief that their team could repeat the cup heroics of 2014 and 2010. That faith appeared misplaced in the opening 20 minutes as Rovers started nervously, perhaps a reflection of their own fragile confidence following a run of just one win in five games in League One. The passing and movement of Premiership opposition was proving too quick for them to close down, and the skittish visitors were forced into survival mode as they retreated around their own 18-yard box. The defence stood up the early Hibs pressure with Iain Davidson getting a vital block on a Marc McNulty strike, and in a rare Rovers foray up the park, Tony Dingwall forced Ofir Marciano into a diving save with a long-range strike. With Raith defending deep, Hibs were getting too much space in which to play, and Stephen Mallan fired a warning shot with an effort from 20 yards that grazed the post. The home side were eventually ahead on 23 minutes when Daryl Horgan found himself in acres of space at the edge of the box before bending an exquisite finish high past Thomson. The goal had been coming but Raith almost responded immediately as a ball over the top found Flanagan racing clear, but he failed to get his shot away and Paul Hanlon raced back to concede a corner. A few minutes later, Flanagan sent a cross into the Hibs box which found Dingwall unmarked six yards out but at full stretch, the midfielder could not get his header on target. This was more encouraging from Rovers, who were now settling into the game, but Hibs were still finding space in the Raith half, leading to a second goal on 38 minutes. A cross from Horgan was deflected into the path of McNulty, and his lay-off was met by Vykintas Slivka who drilled it low past Thomson from 16 yards. At 2-0 down Rovers now had a mountain to climb, but with more than half the game still to play, the tie was not completely over. Their start to the second half was promising as Euan Murray broke into space on the right side of the box but rather than send the ball across a crowded goalmouth, he blasted a shot over the bar. There was also a glimpse of goal for Flanagan after a neat one-two with Dingwall, but from 20 yards, the winger was unable to keep his effort under the crossbar. Hibs seemed to have lowered a gear from the first half, but they were able to put the tie beyond Raith with a third goal on the 58-minute mark. A ball over the top caught the defence flat-footed as McNulty raced clear and slotted the ball beyond the outrushing Thomson. The tie was now effectively lost, and it could have got worse had Florian Kamberi not been wasteful in his finishing. Raith were forced to replace Kevin Nisbet after the striker felt a twinge in his hamstring, with Chris Duggan coming on, and his first involvement was to race into the box and win a corner, from which the away side grabbed a consolation goal. Flanagan's near post delivery was bulleted into the net by the head of Murray for his fourth goal in nine games, and the away end celebrated in the hope of an unlikely comeback. Rovers certainly had a go in the closing stages, pushing players forward, and had Murray's next headed attempt from Flanagan's long free-kick into the box found the net, instead of flashing a yard wide, then Hibs may have got rattled. In the end the home side were able to see out time relatively comfortably, and they can now look forward to Monday's quarter-final draw, while Raith can reflect on a positive cup run which brought the highlight of a Fife derby win, as well as some much-needed extra funds. 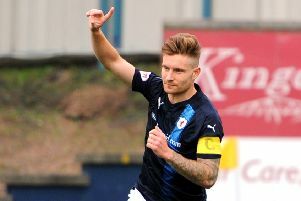 Raith players were applauded off the park by the travelling fans for their efforts, but for them, the focus returns to finding a solution to their inconsistent league form, starting with a must-win match at home to league leaders Arbroath next week.